Let’s talk about the concept of structure and choice. Camps have all sorts of different formats. Tell me how your camp organizes its program. There are two basic things to talk about in terms of our routine. One is the main course of classes or activities where campers choose swimming or horseback riding or tennis or pottery or whatever they want to do, and these are classes they choose based on their own interests. They have four of these per day and they take these classes for two weeks at a time. At the end of two weeks they pick another round of four classes. Our campers have dozens of classes to choose from. I think that’s what appeals to families who are inquiring about our camp. Secondly, all of the other times of the day that are important to the camp experience — evening programs, free time, meal time — allow for a balancing of structure and choice. Why does this type of activity organization appeal to parents? And why does it appeal to kids? I think there are two parts. Some parents will say, “My kid isn’t a typical kid. He doesn’t want to do sports all day. He likes science and the outdoors” or, “My daughter is really creative and likes dance.” Whatever it is, they want to pursue this individual or creative goal. That’s the first part. It’s appealing because you aren’t being forced to engage in an activity you don’t want to do, which tends to happen in school. On a more subtle level, what also appeals to children and parents about camp life isn’t so much that they can find themselves in a pottery class because they’re more artsy and don’t have to do football – it’s more that they are immersing themselves in an environment where they can follow their own lead. They can feel that they are that much more in charge of their life. That’s the beginning of creating an identity. You’re creating an identity for yourself separate from your family, from whatever the expectations are at school and from peer pressure that might take place there. Mostly, separate from the expectation that you act like everybody else. You get to know what makes you tick. That’s rewarding in and of itself because right at that moment there’s the joy of discovering what you like to do that forms the basis of figuring out who you are. That’s an amazing, subtle change that campers can’t possibly realize is happening in those moments. Exactly. You think you’re just choosing an activity, but really, you’re finding yourself. Let’s talk more about the balance between choice and structure. I think the key is to understand that it’s not a question of choice or structure. In a good camp you’re actually doing both simultaneously. That’s what a successful MCE camp does. We’ve actually had parents write us letters about this. What they imagine is that their kid is thinking how no one is telling them what to do, no one is watching. But in reality, there are staff that are very aware of what is going on, who are guiding our campers at all times. But staff provides such a light touch that the campers don’t feel as if they’re interfering in the process. The kids are making the choices, but we are there providing the supervision. For example: You’re in a pottery class and for the first 15 minutes you hear the teacher say, “Here’s the clay. These are the safety rules.” And then the teacher gives you the clay and you start building things. The teacher floats around the room and the campers can work on a project by themselves or with someone else, and every once in a while the teacher will stick her nose in and say, “That’s really cool.” The campers can feel as if they’re being their own person and no one is interfering in their creative process. That same sensibility can happen in a cabin full of campers. If it’s rest period and they’re playing a game, and the counselor is hovering nearby, the campers can just play their game and feel like they are living their life without adult interference. But there’s always someone there. Do you train the staff a certain way to make this happen? Absolutely. We teach the staff how to achieve that balance. Sometimes you need to stick your nose in a little more and provide structure and choice simultaneously. Like, “Tonight there are three things we can do. You decide.” So there aren’t too many choices because sometimes that can be too confusing for a child. But if you say, “Here are three things, let’s do one,” then you’ve achieved a balance. In an age of helicopter-parenting where kids are used to getting everything they want, how do you work in this balance-mentality? There’s a process of adjustment coming into any camp situation. But after a few days or a week, campers will adjust to any environment especially when they know – when push comes to shove — that there are adults there who will provide some structure. Not structure in the sense of lots of rules or a strict routine, but structure in the sense that if there’s a little confusion or conflict, an adult will step in and help you out. I think in terms of the helicopter-parenting, parents push children through from one structured experience to another, and so camp might be a bit of a shock. But kids see other campers adapt, and so they do, too. How do you work with parents who want their children to participate in certain activities? Sometimes we get into this with swimming. That’s one area where parents rightfully feel like their child needs to learn how to swim. In that particular area, we encourage parents to have their children sign up for swimming. And if their child balks while they’re at camp, we’ll back the parents up because we want them to learn how to swim, too. But in anything else, if parents say they want their children to learn mountain biking or whatever, then at that point, it’s really the child’s interest and about making the child happy. 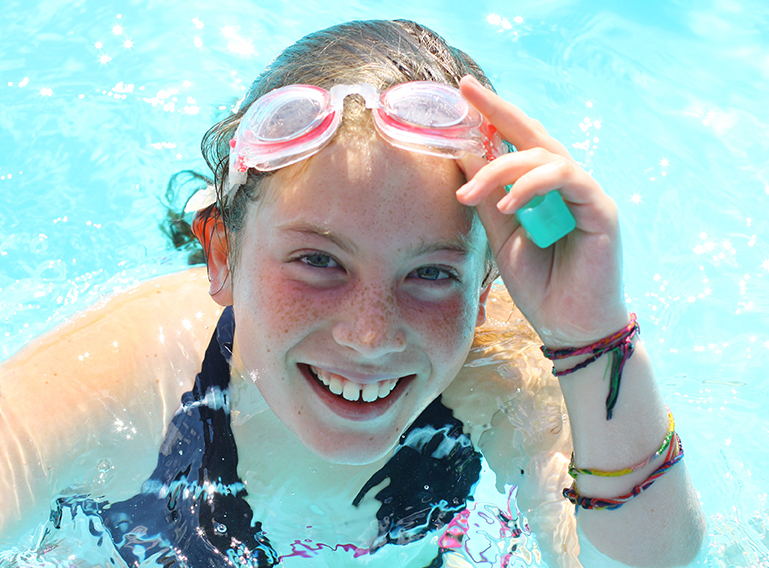 What do you think parents should look for when selecting a camp and thinking about activities? Are there certain questions they should ask directors? If they’re looking for a particular activity, if they really want their child to perfect tennis for instance, then there’s a number of activities they can ask about. “Will my child be able to play tennis whenever they want?” “Will they have to wait in line?” If they’re worried about a particular activity, then there is a certain set of questions to ask. But if it’s more of a philosophical issue, “Will my child feel as if they are doing what they want?” “If my child doesn’t like an activity will they be able to switch out of it?” Then I think there are two issues. One is finding out what the policies are and the other is how the routine is established. Then you get into the more subtle issues of how directly involved are the directors, how are the staff trained to achieve the balance of structure and choice, how responsible will the staff be if a child says, for example, “I signed up for horseback riding but I’m afraid of horses.” Is someone going to be there to help the child struggle through the choice they made? Then you can talk to other parents who sent their children to the camp and discuss their experience. Parents must think about what level of decision-making they want their children to be involved in. But also, to trust that with the guidance of the staff, campers can make good decisions on their own. It’s the adventure of getting from the beginning of the day to the end of the day – all on their own. What a wonderful thing.